Applications for 2019/20 are now open. Full-time: one year, 6 to 8 hours per week of classes. Part-time: two years, 2 to 6 hours per week of classes. Speech and language processing examines language from two distinct perspectives. Speech processing deals with the science of spoken communication, how speech is encoded by the speaker and decoded by the listener. It is also concerned with the processing techniques used to model speech in ways that can potentially be implemented in technology, e.g., speech synthesis. Speech science is at the intersection of many disciplines: acoustics, linguistics, engineering, psychology, anatomy and physiology, and is key to the understanding of disordered speech. Language processing, in parallel, involves computational aspects of linguistics. It addresses theories of grammar and meaning, and provides access to the fundamentals of linguistics, both as a science and as an engineering discipline. As an engineering discipline, it is concerned with technology applications and tools that exploit linguistic knowledge, such as predictive text, automated personal assistants, web search, etc. As would be expected from the inherent multidisciplinarity of the area, students come from many backgrounds. Proficiency in mathematics and computing is an advantage, though not a requirement. Many graduates have been employed in the area of Speech and Language Technology, a rapidly growing sector, e.g. Google, LinkedIn, as well as in smaller technology companies. Many have progressed to Ph.D. studies in C.L.C.S. and elsewhere. In keeping with Trinity College's admission requirements for postgraduate students (see here), applicants should have at least a 2.1 honors degree from an Irish university or an equivalent degree from another country (for example, a Bachelors degree with a GPA of at least 3.2). 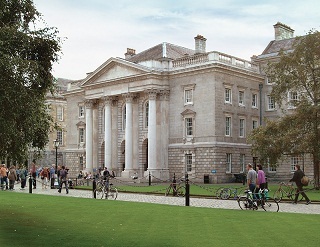 For overseas applicants, country-specific information regarding admission to Trinity College can be found here. Applicants whose first language is not English and who have not been educated through the medium of English must meet the College's requirements for English-language proficiency (see here). The modules are taught in Michaelmas and Hilary terms, and students prepare and write a 15,000-word dissertation which is due on the 31st of August. Read our Frequently Asked Questions on the M.Phil. in Speech and Language Processing and related M.Phil. programmes. For a more in-depth insight into the shape and content of the programme, please consult our current course handbook. Note that the information provided in the handbook is subject to change from year to year.